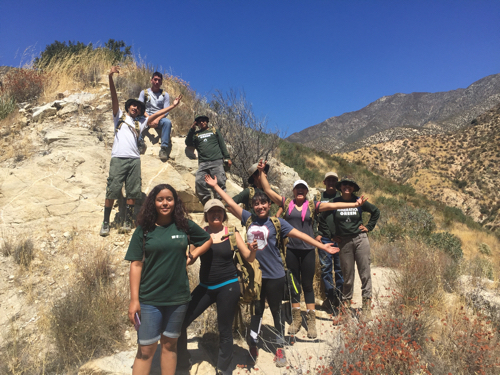 Celia Contreras lead a group of youth environmentalist on a hike in their local mountains, the Angeles National Forest. 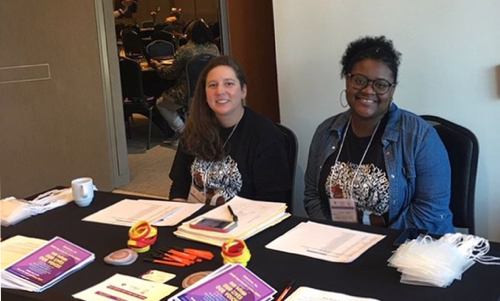 Cierra Sherman, right, at the In Our Own Voice: National Black Women's Reproductive Justice Agenda Policy Briefing with Carly Calhoun, SisterLove's Reproductive Justice-HIV Policy Fellow. For students in Community Studies, the concept of a classroom extends beyond any room, building, or campus to encompass communities throughout the United States and beyond. All students in the program engage in a six-month field study, joining a social justice organization to apply the critical theories they have previously learned during their interactions with more traditional elements of the college experience. “When you are in the field for six months actually putting what you’ve learned into practice, it makes it more tangible,” said Celia Contreras, a community studies student just recently back from her field study. This type of hands-on experiential learning is a vital part of the program. Students first learn academic theories relating to community organization and social justice work, engage in their field study and then return to reflect on and analyze their experiences. “It’s preparation, experience, and analysis,” said Mary Beth Pudup, Community Studies Program Director. Contreras spent her field study stint with Pacoima Beautiful, an environmental justice organization located in the San Fernando Valley, which contains a portion of Los Angeles and several of its many satellite towns. Contreras will now present the fruits of her experience in a poster to be shown to her peers as part of Community Studies Poster Session, starting at 6 p.m., Thursday, Feb. 15 in the Oakes Academic Building. “It’s a visual essay of sorts, without all the academic jargon,” Contreras said. Pudup said the poster session is valuable academically, but also presents an opportunity for the students to proudly display the fruits of their labor. “It encourages reflection and analysis, but it also gets out the word about the tremendous work our students do,” she said. This year students are returning from a wide array of community organizations, both near and far. One student got a shout out from President Barack Obama when he attended the first ever Obama Foundation Summit in Chicago representing his Oakland-based field study organization AYPAL, which advocates for low-income members of the Asian and Pacific Islander community in the Bay Area. Another student travelled to Twin Falls, Idaho, where she spent her stint helping recent refugees gain literacy in the English language as part of the College of Southern Idaho Refugee Center. Another student stayed closer to home working at the Pie Ranch, a working organic farm in Pescadero that also runs food education and farmer training programs. Jered Lawson, co-founder and co-director of Pie Ranch, is an alumnus of the Community Studies Program. “In this program, the students come together, they burst apart to all these different places, and then they come back to campus to share their experiences,” Pudup said. Jessica Chuidian-Ingersol worked with Tenants Together, a tenant organizing group that is working on the persistent housing crisis in the Bay Area, which afflicts Santa Cruz and university students as well. The session not only helps students contextualize but provides an opportunity for them to see and comment on the work of their peers.